The Holidays are about over - but I've still got a lot of leftovers. Not to mention the fact that I'm trying to get back to eating as healthy as possible. So it goes - I don't want to waste all of that food - nor do I want to get myself right back into a food coma. With the colder snow storms making their way into Nashville - this was the perfect recipe to keep me warm, ditch some leftovers, and eat healthy - not to mention stay on budget. By grilling the chicken, you really enhance the flavor of this soup. At the same time, it helps to quicken the overall cooking process altogether. I suggest making this over the weekend - serves 4 with filling and comforting ease. Grill chicken breasts until cooked through. Rest for 5 minutes, dice, and add to soup when finished. Saute onions and carrots in EVOO in a dutch oven over medium high heat for 5 minutes, or until just tender. Add garlic and continue to saute for another 3 - 5 minutes. Next, add tomatoes and stock - adjust seasoning with salt and pepper and bring to a boil. Add orzo and allow to simmer for 10 minutes, or until orzo is tender. Add green peas and cook for 2 minutes - taste and adjust seasoning w/ S+P. Turn off heat, add fresh basil (add grilled chicken here too). Stir until incorporated. Serve w/ grated parmigiano. The past few weeks have been a whirlwind. Between planning a wedding to launching MOONSHINE into our first big box store to running a marathon to traveling to . . . well, I think that's enough by now. None of the above should be taken as complaining. In fact, I've quite enjoyed this bit of overload - rather over loaded than have nothing at all. So - I was quite happy to board a plane bound for Portland OR to shoot a new series of videos for Cupcake Vineyards. I've been working with the fine folks over at LANE PR for weeks - developing content, recipes, photos, and videos for an upcoming roll out that I think you all will enjoy. More to come around Valentine's Day. Anyways, since we shot in Portland - a city I've always wanted to go to - but the winds of fate had yet to carry me there - I extended my trip by a day to take in the sights and sounds. I'm sure glad I did. Such a great, unique, and quirky city - filled with solid people that evoke many of the qualities of Southern hospitality. It's a place I definitely want to re-visit. A kind thanks to those at The Heathman Hotel, The Teardrop Cocktail Lounge, Clyde Common, Greg at OX, Mark at The Parrish, and all of the other great folks I got to meet upon my visit. More to come from production crew and the great folks who lent a hand in putting together some entertaining and informative videos - that requires a separate entry! Anyways, enjoy some shots from my journey. Sometimes, I simply out do myself. Yes, I realize it's been a few weeks, and my posts have been lacking. So to make up for it, I'm delivering a 'Top Chef' esque recipe and photo to make your mouth water. This recipe exudes luxury - from the tender filet of beef, to the silky mashed potatoes, to the crunch asparagus, and finally to the rich and creamy red wine sauce. Forget about having her over - this meal will probably make her stay a while. FIRST: Preheat oven to 425 degrees F. Heat a large pot of water over medium high heat. When water comes to a boil, add potatoes and garlic cloves and cook 11-13 minutes, or until fork tender; remove from heat and set aside. Next, lay out asparagus in a single layer on a baking sheet; drizzle with 2 tablespoons of oil, season with salt and pepper, and toss to coat each spear. SECOND: Heat a cast iron skillet over medium high heat and season filets with salt and pepper. Add remaining oil and sear filets, undisturbed, for 2-3 minutes. Flip filets, and insert into the bottom rack of the oven until internal temperature is 135 degrees F for medium rare/medium, about 5-7 more minutes depending on the cut. Remove filets from oven and tent with foil to keep warm and rest. Meanwhile, place asparagus on the top rack of a 425 degree oven, roast for 8-10 minutes, shaking pan on occasion to ensure asparagus cooks evenly. THIRD: Place the cast iron skillet used to cook steaks back on stovetop over medium high heat and sauté shallots for 1-2 minutes. Deglaze pan with wine, and reduce mixture by half. Add stock, and once again reduce mixture by half. Remove from heat, add 2 tablespoons of butter, and season the pan sauce to taste with salt and pepper. LAST: Drain potatoes; using either a potato ricer or masher, mash potatoes and garlic into a mixing bowl. Fold in the remaining butter and cream and season potatoes to taste with kosher salt and fresh cracked pepper. 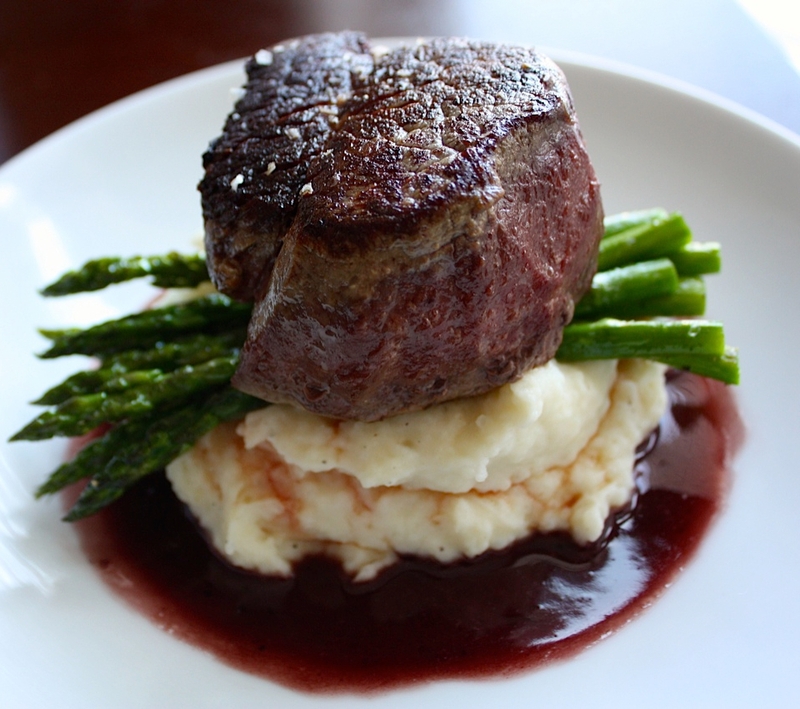 Plate a portion of potatoes on the center of plate, top with asparagus, and finish with the filet. Spoon the red wine pan sauce around the perimeter of the plate. Serve. Been a busy weekend. Enjoyed the day off today for Veteran's Day, but mainly tried to be as productive as possible catching up on all of the other odds and ends of life that I tend to ignore. Car maintenance, house cleaning, taking about 1000 lbs of odds and ends to Goodwill, and so on. I feel purged, caught up, and ready to take on the week. Surprise - more travel. Oh well - beggars can't be choosers. The next few months will be filled with quite a few more exciting updates - from the food world, merchandise world, TV world, and so on. Stay tuned - I'll be 'leaking' info here and there and along the way. Nevertheless I did slow down a bit to enjoy a hearty breakfast after my morning run. It was the perfect healthy and nutritious start I needed to get my day moving. This omelet, along with some Community Coffee saved the day. Enjoy! Heat oil in a non-stick skillet over medium high heat; add tomatoes. Cook tomatoes for 1-2 minutes; add eggs. Gently lift cooked portions off egg of the bottom of the pan while tilting the pan to allow the runny portions to reach the heat - do not scramble. Once egg mixture is set, quickly flip entire egg mass in pan. Cook for one more minute, add cheese to one side, fold, and plate. Top with sliced avocado. Serve. I helped collaborate on this piece for The Art of Manliness a few months back, and I wanted to share it with all of my readers here. In my book, I provide a detailed list similar to what you'll read below, that utilize all of the following types of equipment in my recipes. I hope you will find this tool useful when it comes to stocking your kitchen! 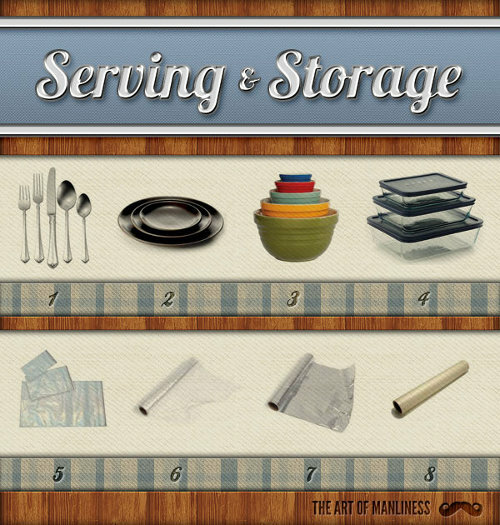 Full text from The Art of Manliness can be found here. If there remains a lingering sense among older generations of men that cooking is “women’s work,” I would think it is probably fading greatly among the younger set. True, for much of human history men did the hunting/farming and women did the cooking, and this arrangement continued to work well into the 20th century. Young men made a quick transition from living with their flapjack-flipping mother, to settling down with a meatloaf-making wife. Or, he lodged at boarding houses that provided victuals along with a bed. But those days are long gone; accommodations that come with a cook are now virtually non-existent (although it lives on in fraternity houses), and men are remaining bachelors longer – well into their late 20s and early 30s. As all modern men still need to eat virtually every single day, the only choice that remains is either starving…or being completely dependent on restaurant meals and take-out food. Keeps you healthy and strong. When you cook for yourself, you know and control exactly what you put in your mouth. Almost anything you make for yourself, even the same dish served at a restaurant, will have less salt, fat, calories, and additives than the commercially-made variety. Saves you money. Sure, it is possible to eat cheaply by ordering all your food off the dollar menu, but while fast food won’t clip your wallet, it will take a toll on your health, which will cost you big bucks down the line. When it comes to making real, wholesome food, cooking at home is generally cheaper than eating out. Impresses the ladies. As a young man, you’re going to be dating, and nothing impresses a gal like a man who can invite her back to his place for a home-cooked meal. Gives you enjoyment. No, I don’t always enjoy cooking. But when you have time and are in the right mood, it can be very satisfying to create something tasty for you and for your friends/family. Now, I’m not a home cooking zealot. Sometimes the way I feel about cooking can be summed up in this comic from The Oatmeal; it can seem like it is more hassle than it’s worth, and when you’re super busy and stressed, the convenience of take-out is a lifesaver. The key is striking a balance, and you can’t do that if you can’t cook anything beyond toast and ramen. The good news here is that while gourmet chef-ery takes a lot of training and practice, simple cooking can be learned by anyone who knows how to read. So in this post, we cover many of the basics a young man who’s never cooked for himself needs to know to get started. First we’ll talk about how to stock your kitchen with equipment and your pantry with staple items. Then we’ll talk about a few basic skills and bits of know-how you need to learn in order to cook edible, hopefully delicious, food. 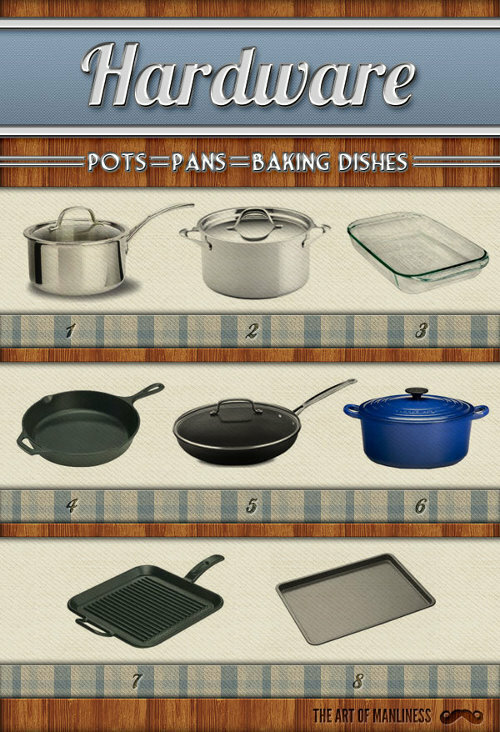 Finally, because you don’t need to amass the kitchen equipment listed below all at once, we’ll talk about some things you can cook when your options and tools are limited. For me, it’s always about quality over quantity. Instead of investing in specialty garlic presses, zesters, or other gimmicks – just give me a killer knife that’ll do all those jobs and not get lost in my junk drawer. Less is always more. 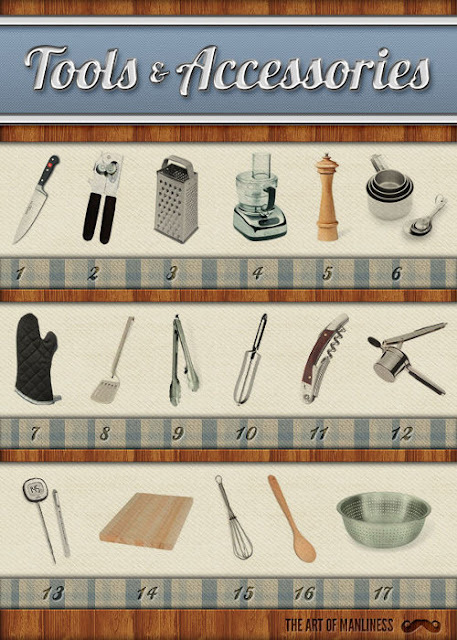 For that reason I’ve put together my list of essential kitchen equipment needed for every guy. You don’t need to go out immediately and stock your kitchen with everything listed here. You can acquire this stuff over time. Be resourceful and check yard sales, flea markets, or online outlets that offer these items at great deals. Meanwhile, improvise and make the most of what you have. (1) Small 2.5-qt Pot with Lid - terrific for making sauces, steaming veggies, or heating liquids. 1 Large 6-qt Pot with Lid - perfect for boiling pasta or potatoes. 9×13 Pyrex Baking Dish - a must have for baking or roasting. 12-Inch Cast Iron Skillet - cast iron cookware is inexpensive and will last a lifetime. On top of that, it cooks evenly, retains heat, and is also believed to keep you healthy by supplying a steady dose of iron to your diet. For more tips on use and care, check out my post from last month! 12-Inch Non-Stick Skillet with Glass Lid - the non-stick surface makes cleanup quick and easy. Dutch Oven Style Pot with Lid - enameled cast iron is the best option; however any pot with a heavy bottom will do the trick. Great for making soups and braising meats. Grill Pan - a fantastic substitute for a grill. I prefer cast iron grill pans over the non-stick versions. Non-Stick Baking Sheet - super cheap, and probably one of my most utilized items in the kitchen. 8-Inch Chef’s Knife with a Sharpening Steel - a chef’s best friend. Don’t go cheap here. Can Opener - I prefer the manual ones – still never figured out the electronic versions. Box Cheese Grater - I like these because it provides several different options in one; a slicer, a rough grate, a fine grate, and an extra fine grate for harder cheeses. Choose one with a large base to provide more stability. Food Processor/Blender - the workhorse of the kitchen. Great for saving time and creating specialized dishes. Pepper Mill - indispensable for any kitchen. Fresh cracked pepper is worth the extra effort, and this tool makes it easy to always have it on hand. Measuring Cups and Spoons - these will be absolutely necessary to make sure you are getting the right measurements when following recipes. Pot Holder/Oven Mitt - because I don’t know anyone who likes to burn themselves. A folded towel will also work. Spatula - my preference is stainless steel slotted spatulas. Tongs - great for when you need a more precise touch. Vegetable Peeler – fantastic for peeling fresh vegetables or shaving cheeses. Wine Opener - I prefer the ones that also have a bottle opener. A drill, drywall screw, and pliers will do the trick if you find yourself in a bind. Trust me. Potato Ricer/Masher - a ricer is a great tool for making silky smooth mashed potatoes. A masher is an even cheaper and more versatile tool that will provide a more rustic consistency. Digital Meat Thermometer - a useful tool to make sure your meat is always perfectly cooked. Cutting Board - I prefer a large wood cutting board over any other surface. Make sure it has a solid footing, so as not to slide while cutting. Whisks - extremely versatile; fantastic for making vinaigrettes, dressings, or even a roux. Wooden Spoon – heatproof and durable, I like having these in several different sizes. Colander - a must-have for draining, washing, straining, or rinsing. Check out this month's feature for The Art of Manliness, featuring my famous Sunday Supper! These days, it’s rare for me to spend a weekend at home in Nashville. Between the demands of work, relationships, and other opportunities, it seems my time is spent on the road more often than not. Many of you know my pain of hitting the deck at 11 p.m. on a Sunday evening just as you roll into town, only to get back to business early Monday morning. But such is life, and besides, travel does have its perks. When I do find myself lucky enough to spend a weekend in town – I tend to savor every moment. Especially now that fall is in full swing. I like to start my Saturdays with a long run, prepping my body for the abuse of tailgate food, a few cold beers, and hours-upon-hours of watching college football. But Sundays are different. I wake up early, clean house, go to church, and start cooking. Many of you were probably nodding your heads in agreement up until the cooking part – or the waking up early part! Don’t worry, there are always a few NFL games providing my entertainment soundtrack while I am in the kitchen. Cooking a Sunday Supper gives me a chance to reconnect to the town and friends I love. I head down to the Nashville Farmers Market to pick up farm fresh vegetables, shoot over to Lazzaroli Pasta to chew the fat with Tom, and finally round things out by visiting my favorite butchers at the local market. I’m not an outspoken foodie or ‘locavore’, but there’s something about creating relationships behind the food that tends to make my meals taste better. That being said, at this stage in my life, my social scene is all over the map – friends who are single, dating, engaged, or just starting out with young families. It’s a unique stage – some yearning for companionship, others just looking for a break from the routine. Then there’s always the musician friend or two that’s looking for a square meal after a solid week on the road – a common theme here in Music City. So, I usually receive a resounding YES when I invite ten or twelve of my closest friends over for a Sunday Supper. In fact, most of them have grown to dislike my busy travel schedule – for selfish reasons of course. Sunday Suppers are always casual. I like to make comforting meals that can be prepped far in advance, and finished off with little to no hassle. After all, the whole point of hosting and entertaining friends is to enjoy their company – not to be stuck sweating away in the kitchen. Whether you are single looking to entertain friends, or you are taking over the kitchen duties to cook your family a hearty meal, I recommend my favorite Sunday Supper menu below. I’ve even gone so far as to create a shopping and prep list to assist you when making the recipes. Whatever your Sunday routine or meal might be, I can guarantee your food will always taste best when shared with others. Plus it never hurts to have leftovers to start the work week! 1) Prep, sear, and place roast in oven for 3 – 5 hours, depending on size of the cut. 2) Watch football for a few hours. 3) When one hour of cooking time remains on the roast, get back into the kitchen. 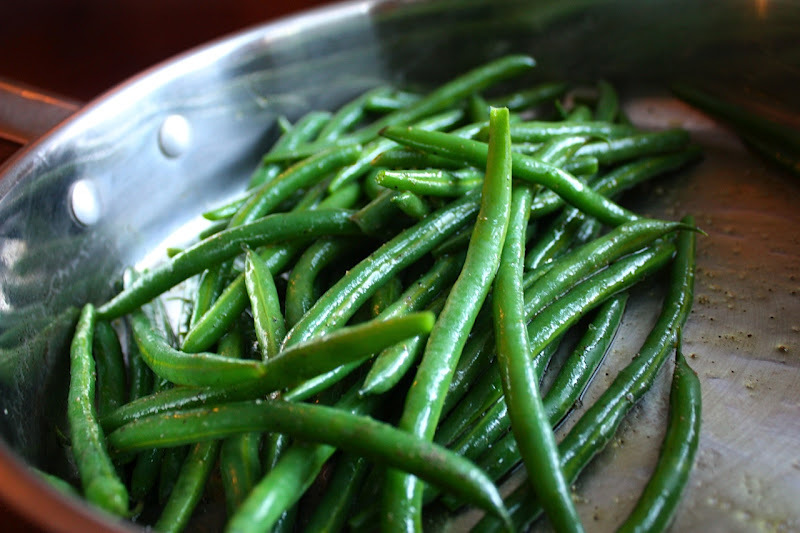 4) Blanch green beans, place in ice bath, drain, and set aside. 5) Wash, cut, and boil potatoes and garlic. 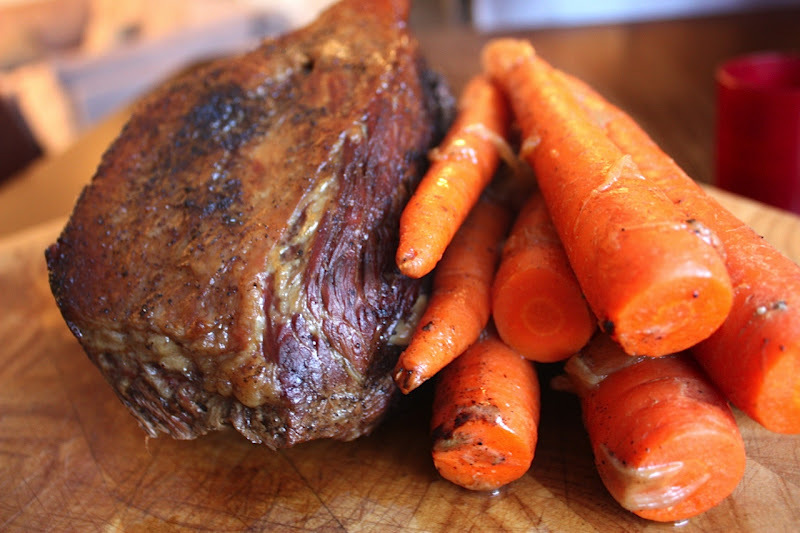 6) Meanwhile, add carrots to pot with roast and cook for 30 more minutes. 7) Mash potatoes, cover, and keep warm on low heat – adding more cream if necessary. 8) Remove roast and carrots, tent with foil. Make gravy. 9) Friends arrive. Table is set. 10) Reheat green beans in butter. 11) Slice tomatoes and season. Arrange on platter. 12) Slice beef, and arrange on platter with carrots. 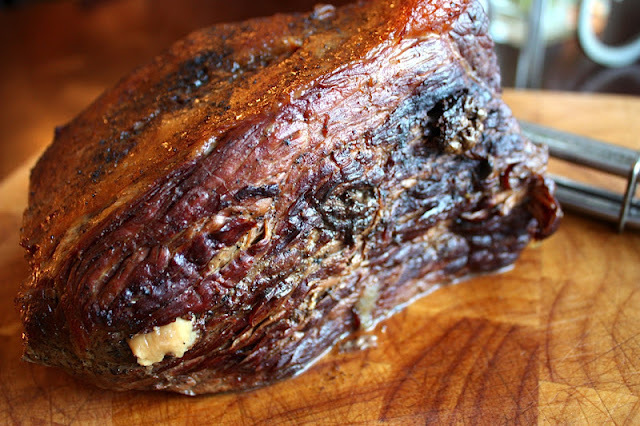 Sunday Slow Roast Beef – a foolproof dish that will make you the king of the kitchen. The garlic will slowly cook down to the consistency of butter, lending its wonderful flavor throughout the meat. Don’t worry too much if your meat shreds more than slices – it will be tender, juicy, and delicious. Preheat oven to 325 degrees F. Next, preheat a Dutch oven over medium high heat. 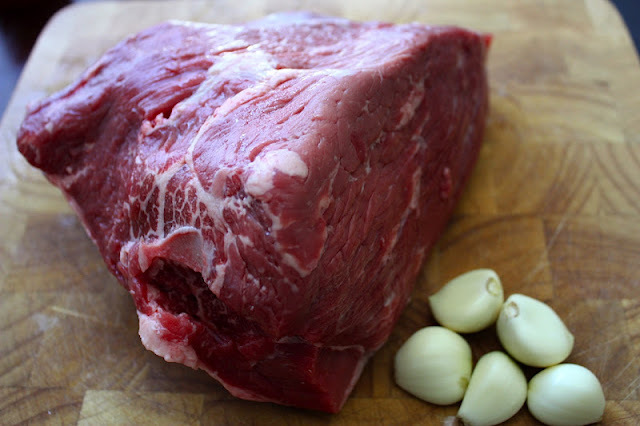 Meanwhile, use a knife to cut small inserts into the beef, stuffing the holes with garlic. Liberally season the entire roast with kosher salt and fresh cracked pepper. Next, sear all sides (except fat cap side) for 2 - 3 minutes, or until browned. Add onions to the bottom of the pot, set roast on top, and deglaze with red wine. Cover and place into the oven to roast undisturbed for 3 - 5 hours (approximately 1 hour per pound). When thirty minutes remain, add carrots to the pot, cover and continue to cook. Remove roast and carrots and tent with foil (15 minutes) prior to slicing thin and on the bias for service. Mushroom and Onion Pan Gravy – guilty as charged. I promise this is the ONE time I’ll ever endorse using that canned concoction. 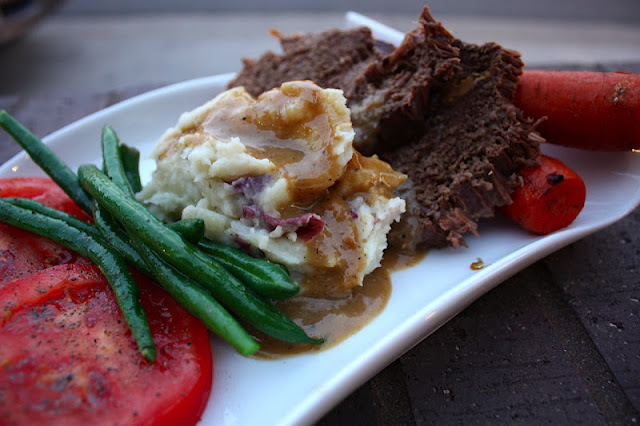 But damn, this gravy is absolutely delicious – and ridiculously simple. Trust me; I’ve won over several-a-chef friends with this gravy, many of whom have also joined me on the dark side of canned processed goodness. If you prefer to make your gravy the classic way, make a slurry of flour/water and add it to the reduced drippings and finish with butter. I promise this version is better though . . . just saying. With the roast removed; skim off any fat from the top of the drippings (the oily stuff floating at the top). Next, crank up the heat to medium high on the stove top and reduce the drippings mixture by half. Add canned soup to dripping mixture, reduce heat to medium-low, and whisk for a minute or so until evenly combined. Allow the mixture to come back up to a slow simmer (to thicken), and turn down heat to low. Serve alongside roast beef and sides. Fresh Green Beans – these will always beat those things out of the can (ignore my comments above!). Again, this is a super simple recipe that can be prepped hours in advance and finished off just prior to serving. Fill a large pan with two inches of water, bring to a boil over high heat. Add 1 tablespoon of salt - blanch green beans in the boiling water for 60 seconds. Strain beans and place in an ice bath until completely cooled. When ready for service, return beans to the same pan and sauté in melted butter until heated through. Season with kosher salt to taste, and serve. Quick & Hearty Garlic Mash – a rustic and informal version of a traditional favorite. The garlic and sharp cheddar flavors provide a nice contrast to the earthiness of the dry seasonings. Topped with plenty of gravy, this is comfort food at its finest. Bring potatoes and garlic to a boil in a large pot with a generous pinch of salt - boil for 12 - 15 minutes. Strain potatoes, and add back into the pot with remaining ingredients. Using a potato masher, roughly mash the potatoes until all ingredients are incorporated and combined. Season to taste with salt and pepper. Serve. Sliced Heirloom Tomatoes – simple and straightforward. I find that the acidity in the tomatoes and their cool, crisp flavor helps to cut through the rest of this hefty meal. Besides, the colors look killer. Slice tomatoes, season with salt and pepper. Serve.